On summer 2008 Gamla Model Makers was approached by US Army Materiel Command (AMC). 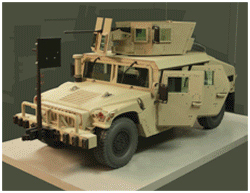 Attracted by our expertise in creating marketing models of military vehicles and aircraft, representatives of AMC were interested in acquiring 4 feet long 1:4 scale custom made model of up-armored HMMWV (Humvee) for exhibiting at trade shows. The model should be based on M1151 version and be equipped with up-armor kit, the latest version of Picatinny-designed Objective Gunner Protection Kit (OGPK) armed with M2 50cal machine gun, “Rhino” unit and heavy duty front bumper with ramming frame, in order to illustrate services offered by AMC. The requirements included opening doors and detailed interior. The timeframe was tight as AMC planned to exhibit the model at September 2008 Association of US Army (AUSA) trade show in Washington, DC. Three month later the model was completed and delivered, on time and in compliance with requirements. As per requirements a set of photorealistic digital product renderings were created and submitted for approval. Upon approval of the renderings the actual fabrication has started. The hull was created out of custom cut plastic sheets, frame and chassis – out of composites, green tinted acrylic sheets were used for windows to imitate an armored glass blocks. All exterior surfaces were textured to imitate armor. The model was detailed at museum level as for exterior and interior. A great deal of time and effort was spent on creating highly realistic wheels. We knew from experience that inaccurate representation of wheels and tires or use of some off-shelf fit-to-size garden cart’s wheels might kill a realistic look of otherwise great model, especially of military vehicle, therefore we knew the utmost importance of this part of the model. The interior was also highly detailed, including dashboard, controls, air-conditioning unit, com unit and interior part of turret’s mechanism. The seats were upholstered with the very fabric that is used for real combat Humvee’s seats upholstery. The model consumed about 700 screws of different types and sizes. The model was accompanied by wheeled transit case designed specifically for it. As planned, the model was exhibited in Washington, DC at September 2008 AUSA show and rightfully became a star, constantly bringing excited visitors to the AMC booth as high quality scale model is a most powerful marketing tool. The model and its impact on marketing and promotion of AMC services was highly evaluated and appreciated by US Army Materiel Command. A success of the model demonstrated again a spectacular effectiveness of marketing scale model and lead to creating even more beautiful and sophisticated 1:5 scale model of MaxxPro Dash International and other military models.